Trip Details: Two night, three day weekend away. This was a quick trip by car for a weekend away in a city. Nothing fancy was needed, so I didn’t pack much. The extra pair of pants was just for backup, but weren’t needed. I wore everything else. This list was for a week long business trip, 4 nights and 5 days. Baron Fig Confidant Notebook, Small. Notes: this all barely fit in the bag, and I could have left the laptop behind. Of the clothing I brought, I didn’t need to bring the Shemag — I wore and used everything else. Trip Details: Two night, three day trip by air for a convention. 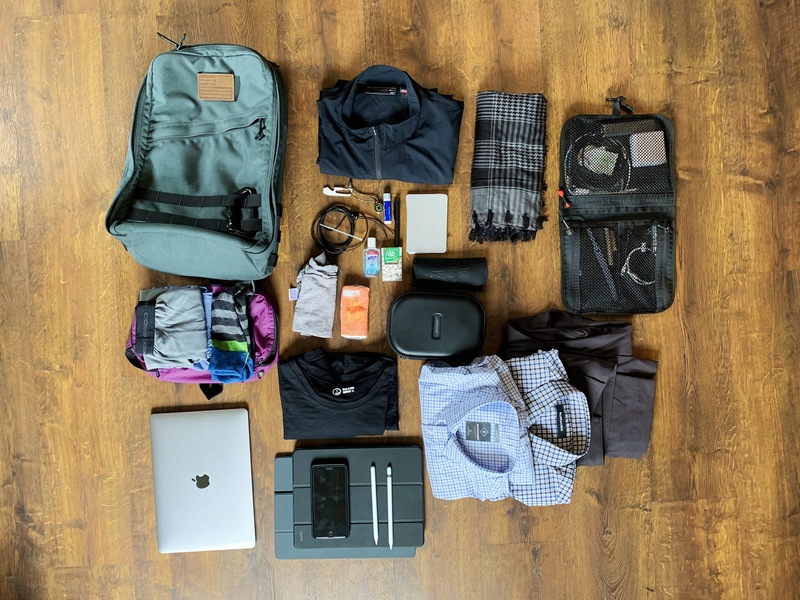 This was my first business trip in a while, so I overpacked a little (I didn’t end up needing my extra undershirt). I could have done with just the Wool & Prince shirt, but I wanted to have some variety. I also brought my gym shoes and clothes as I knew I would have some downtime to hit the gym. Trip Details: Two night, three day trip by air for business meetings. 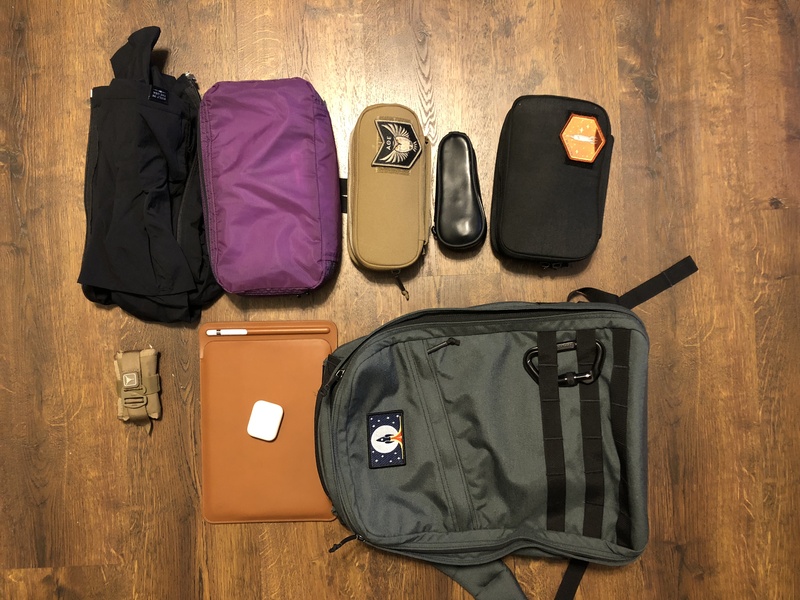 For business travel, I feel like I have my packing list down. With this kit, I could travel indefinitely. For a long trip, I would consider another Wool & Prince shirt over the Mizzen+Main so I wouldn’t have to do as much laundry. I was able to fit both my blazer and down jacket into my backpack for flights with no wrinkling issues on the blazer. The Simple Side Pocket worked well as an extra interior pocket in my GR1. I don’t like the look on the outside but it is a good size for a little extra organization inside. The pocket is unstructured enough that it folds flat and out of the way when it’s not in use. You might also notice that I switched up my underwear this trip, look for a review coming, but the packability and lightweight fabric of the UNIQLO Airism Boxer Briefs has won me over for travel. Trip Details: Three night, four day trip by air for business meetings. The Ministry of Supply Composite Polo performed above my expectations in regards to odor resistance. I got pretty sweaty on a walk from the train to my hotel the first day I wore it, and I was still able to get a second wear. This makes me think in a less sweaty situation, I could possibly get more than two wears, which is surprising given it is only 15% merino wool (with the balance being polyester). Look for a review soon. Over the last weekend of June, I went car camping in western Washington with a two other people and all of our kids. It was a great time, and the second year we did this. This year it rained for most of the trip, even though it was forecast to only have a ‘few’ showers. I didn’t pack anything for real rain. My thinking was that I could use the Simple Windbreaker for the passing rain, as it repels that just fine, and my Rogue jacket whenever it got cool (it’s the perfect jacket for that type of weather). The reality was two and a half days of near constant rain during the day. I spent an entire afternoon on a boat, and part of that was in the rain in Puget Sound. In other words: I was not prepared for this at all — truthfully only our kids were as we always overpack for them. However, things were not nearly as bad as they seemed. I basically lived in one of the t-shirts, the Sequence, and the Simple Windbreaker during the day, with the Simple pants as well. My Salomons take quite a bit to soak through, and only did one time, drying fast. Because of the materials used in these clothing items I stayed warm and pretty dry. Even when the windbreaker soaked through, sitting by the fire dried it fast (be careful with synthetics and heat sources), and the merino layers did their work to keep me warm, and dried themselves fast. One night I had to wear flip flops to deal with the boat, and my feet got a bit muddy. I rinsed them off with water, but not wanting to use a towel to dry them, I put on my merino socks and never once noticed that my feet were anything but comfortable. That was pretty amazing. The entire trip was a testament to what we mean on Everyday Wear when we talk about “better clothing”. I was entirely unprepared for the weather, and it could have sucked. In my mind I knew that even if it got bad, these clothes should do their job and keep me less miserable, but theory is different than practice. And yet, in practice, I was far more comfortable that I ever thought I would be. I was cold twice, which isn’t too bad, and even then only for 10 minutes or so until the fire warmed me up. A large part of this is having a good heat source and fast drying clothes. Even when it was raining on me, I could start drying my clothes just by sitting near the fire. Looking back, I would have liked to have had a true rain jacket with me. That said, this trip gave me a new level of confidence in the clothing we are testing. It’s one thing to talk about how fast merino wool dries when you wash it, and quite another to experience it keeping you warm, comfortable, and drying fast when you are camping in the rain. I spent a lot of time thinking about this during the trip. I never actually felt wet on my back or shoulders, but I knew I was wet. I just felt slightly cooler in those spots for a moment. I don’t recall my pants ever feeling wet, nor being wet when I went to bed. But I do know I sat in more than a few wet chairs. This isn’t to say you should be foolish and camp without proper rain gear, that was stupid on my part. But should you be caught out in the rain walking home from work or to work, and you’re buying the type of clothing we talk about here, it’s going to make your life noticeably less bad. It will be the difference between a ruined event, and a minor footnote of the event. That, in the end, is what we are talking about when we say “performance clothing”. Trip Details: A 3 day, 2 night trip to Boston for a wedding, which required extra shoes and a suit. I really wanted to pack this all in one bag, but I ran into serious problems doing this with needing an extra pair of shoes. My dress shoes were not comfortable enough for the activities we had planned, so I couldn’t wear only them. 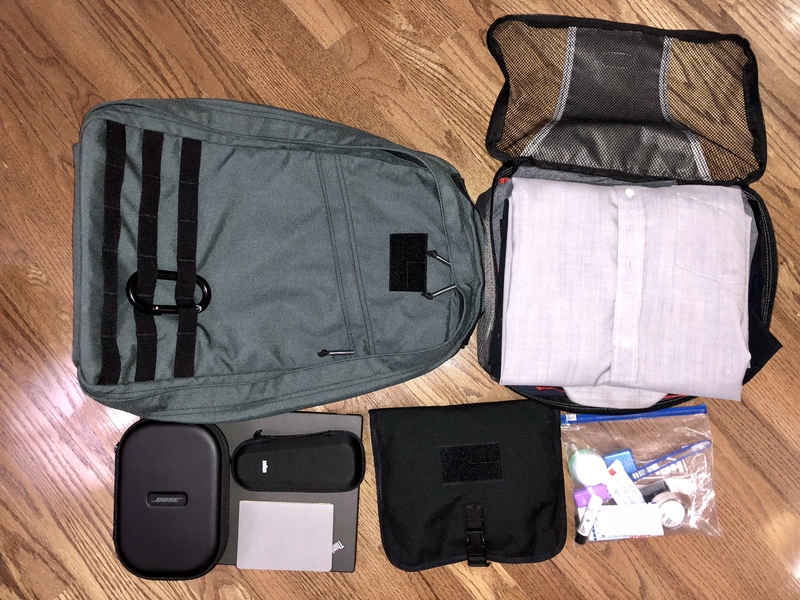 While I could get all of this to fit in my 34L GORUCK GR2, doing so meant that the bag could not fit at my feet. This meant that I would have to do the dreaded overhead space battle with my fellow travelers, and given that my wife was checking a bag already, I opted to do so as well. However, this created a new problem, as you can see the roller bag was mostly empty. 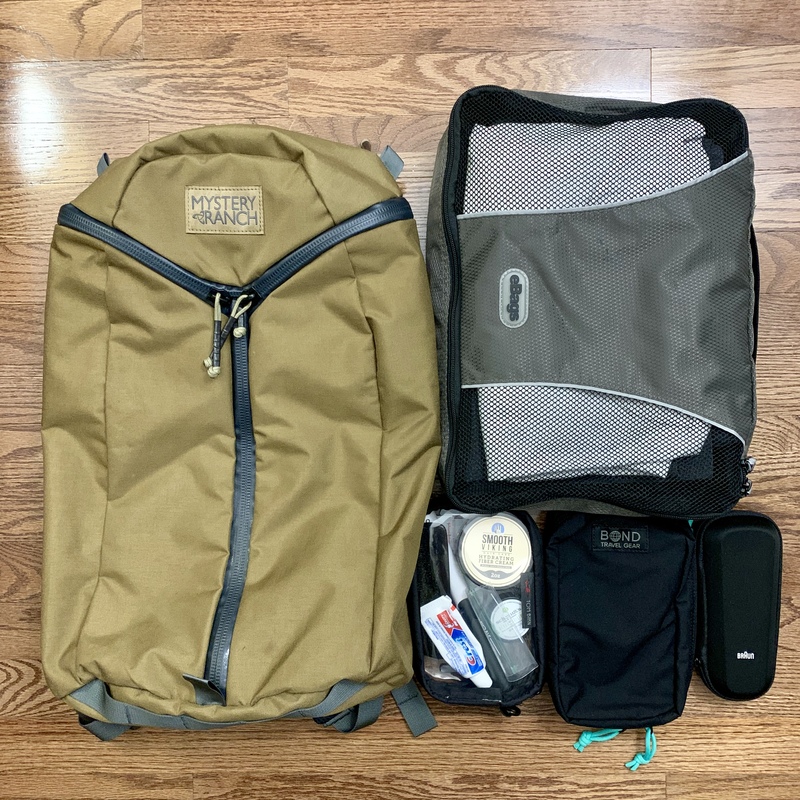 So I packed more than I knew I would need, simply to help fill out the bag more so gear didn’t constantly move around in it. It wasn’t too bad, but I need to think on how better to tackle this in the future. Flying with just a 10L Bullet is magic though, as it will fit on its edge under the seat in front of you, providing tons of legroom. 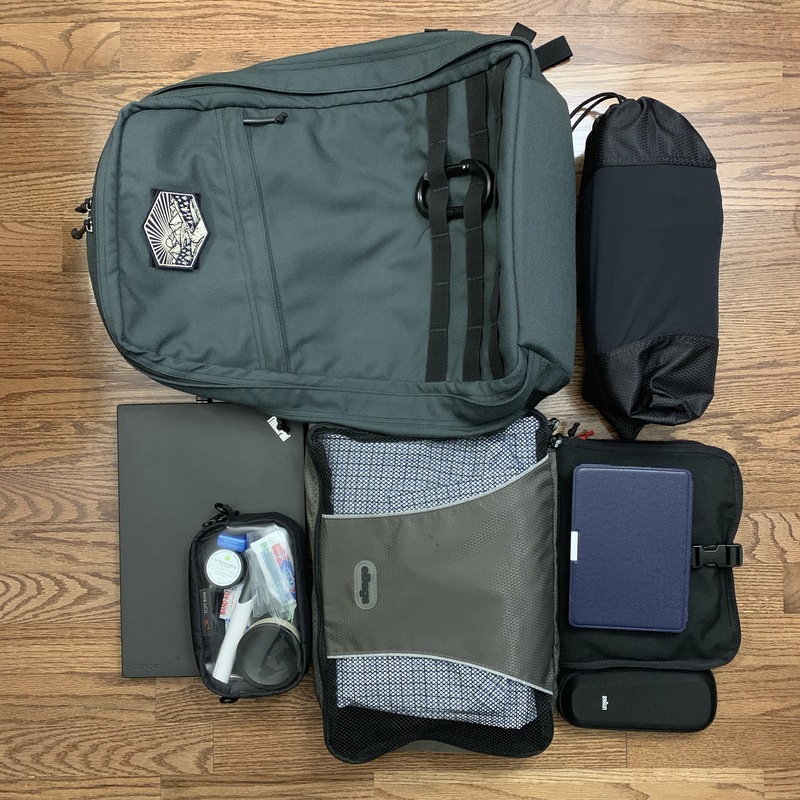 It’s a fantastic travel bag. Trip Details: Three night, four day trip by air and car for business meetings. 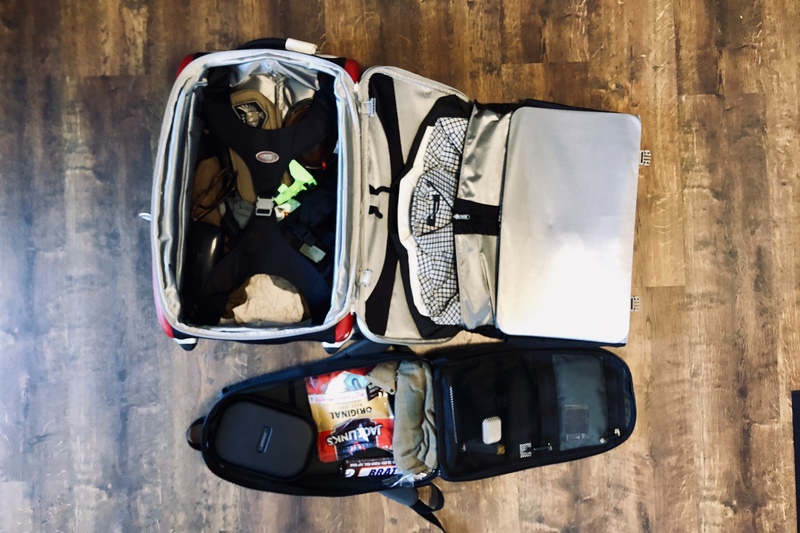 I packed the perfect amount of clothes for this trip. While I could have worn one Wool & Prince shirt the whole time, I wanted to have two to be able to alternate. I did notice a hole in the armpit of my UnderFit shirt (and I have only washed cold and hung to dry), so a bit disappointed at that. The Wool & Prince Blazer was folded and put in my backpack for travel and came out crease and wrinkle free. Trip Details: A 3 day and 2 night business trip with normal office meetings. This was one of the lightest trips I’ve packed for. The travel razor was new, something I bought to try out on this trip as I was tired of my full size razor, and this new one is not good. I easily think I could have gotten by with one pair of pants, but I wasn’t confident the Slim Dungarees would work in the office, and I didn’t want to fly in the Bluffworks as they are a little large for me and cause my shirt to come untucked when sitting for long periods of time. That said, I could have done it in just the Slim Dungarees as my concerns were unfounded. Trip Details: A quick weekend with the family on the Washington coast. 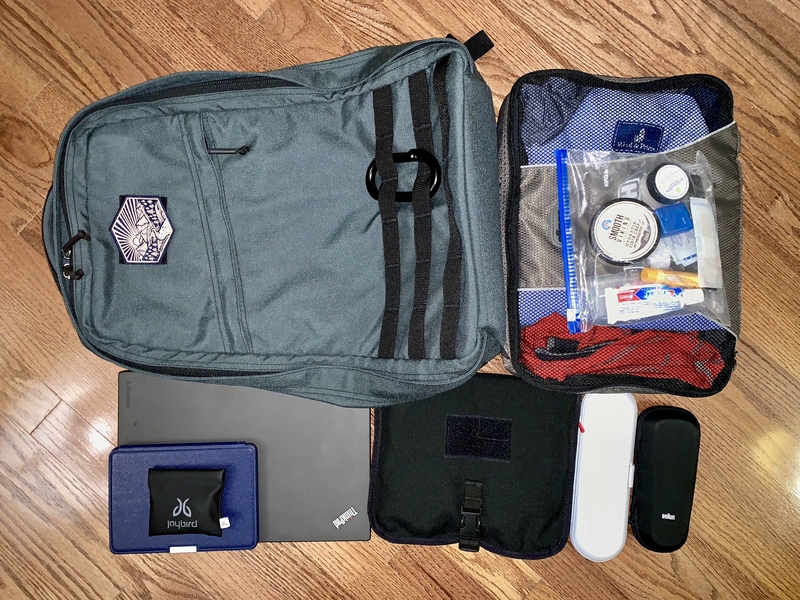 I packed everything in my trusty GORUCK GR1 26L. I packed too heavy for this trip, as I could have left behind my entire beach kit — I didn’t need it. 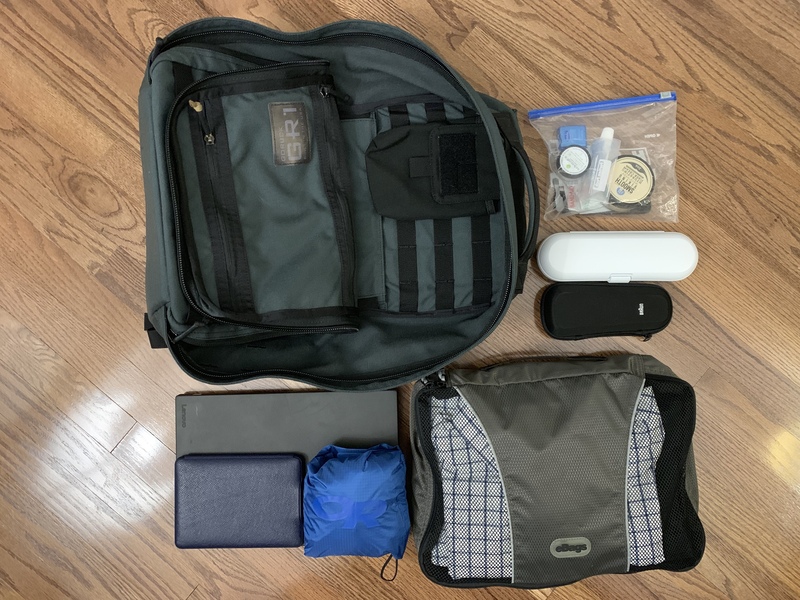 Same with the electronics kit as I had chargers at the destination I used (I’m finding this more and more common, which is hard to deal with when you want to pack as light as possible, but charging is also crucial). 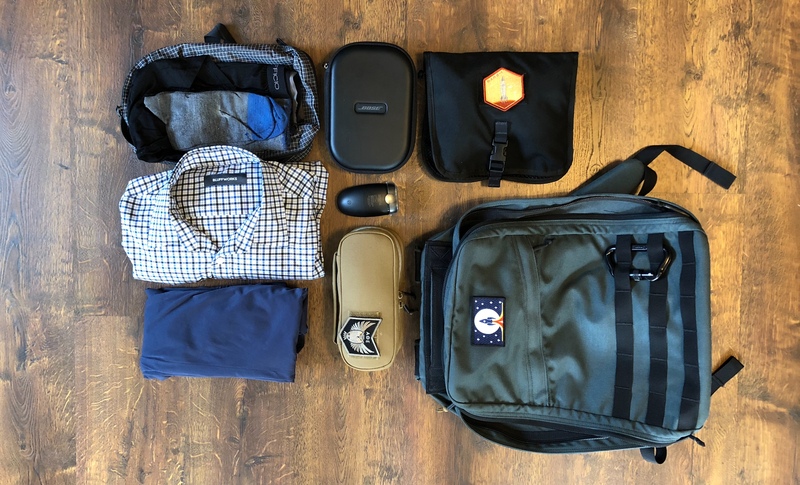 Also the Rucking Tee is normally a workout shirt for me, but it was tremendous this weekend and has me looking to get something else from GORUCK in the PowerDry fabric they use from Polartec. It’s not very odor resistant, but it is very comfortable.